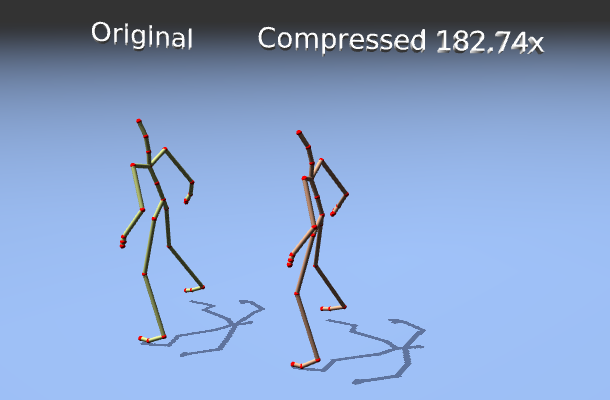 Due to the growing need for large quantities of human animation data in the entertainment industry, it has become a necessity to compress motion capture sequences in order to ease their storage and transmission. We present a novel, lossy compression method for human motion data that exploits both temporal and spatial coherence. Given one motion, we first approximate the poses manifold using Principal Geodesic Analysis (PGA) in the configuration space of the skeleton. We then search this approximate manifold for poses matching end-effectors constraints using an iterative minimization algorithm that allows for real-time, data-driven inverse kinematics. 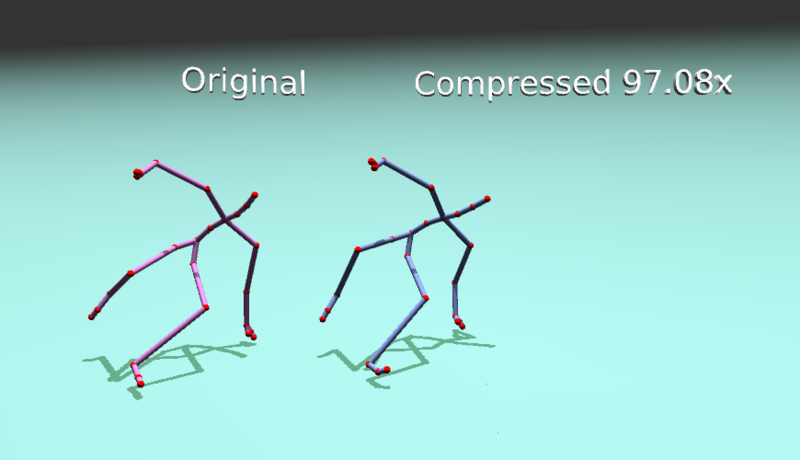 The compression is achieved by only storing the approximate manifold parametrization along with the end-effectors and root joint trajectories, also compressed, in the output data. We recover poses using the IK algorithm given the end-effectors trajectories. Our experimental results show that considerable compression rates can be obtained using our method, with few reconstruction and perceptual errors. Maxime Tournier, Xiaomao Wu, Nicolas Courty, Elise Arnaud, Lionel Reveret, Motion Compression using Principal Geodesic Analysis , Proc. of Eurographics (to appear). Munich, Germany, March 2009.